My goal for OMG - A Monthly Goal was to have completed 15 blocks of which none of the blocks are completed. 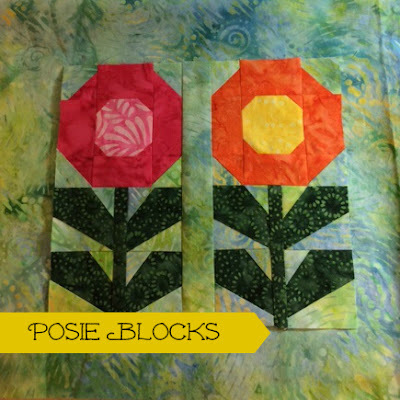 Many evenings were spent paper piecing the flowers in June while watching Hart in Dixie on Netflix. Last evening I began chain stitching the flowers together. Easily I can have the blocks completed by this weekend even though I still have today. But as the day develops business is calling me to focus on it rather finishing up the blocks. Also, we made a trip to visit all our boys and their gals one weekend in June. Now that was much more important than sewing. Such fun we had laughing, cooking, eating, watching one grandson, Caleb, play baseball and celebrating my youngest grandson, Parker's birthday. 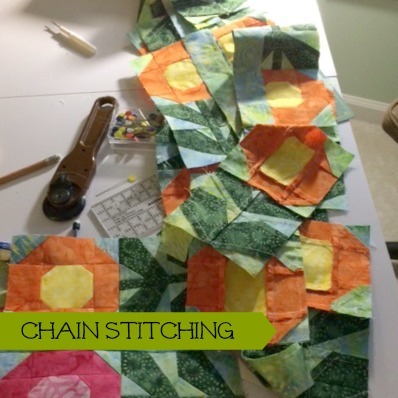 Paper piecing is messy! But then again so is sewing. My little waste basket needed to be emptied daily with all the little scraps and bits of paper being torn off from the backside. When sewing up the promo block I used 1.8 stitch length. It was still difficult to tear the paper with out pulling out stitches so I reduced the stitch length to 1.5. It was much easier to tear the paper off, but the bobbin had to be rewound more frequently. 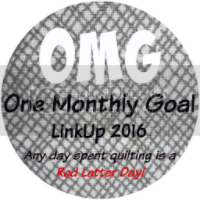 Thank you to Heidi at Red Letter Quilts for sponsoring OMG - One Monthly Goal. It has kept me moving towards finishing projects, and prevents me from starting new ones until current projects in progress are completed. Click on the OMG - One Monthly Goal button to take you to Red Letters Quilts' blog. Glad to know that you had a fun time with your family on your trip. Do keep sharing updates about your projects on the blog. Happy stitching!